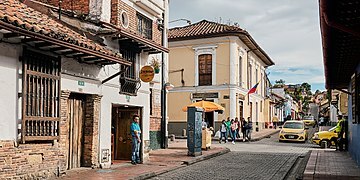 Bogotá (/ˈboʊɡətɑː/, /ˌbɒɡəˈtɑː/, /ˌboʊ-/; Spanish pronunciation: [boɣoˈta] (listen)), officially Bogotá, Distrito Capital, abbreviated Bogotá, D.C., and formerly known as Santafé/Santa Fé de Bogotá between 1991 and 2000, is the capital and largest city of Colombia, administered as the Capital District, although often erroneously thought of as part of Cundinamarca. Bogotá is a territorial entity of the first order, with the same administrative status as the departments of Colombia. It is the political, economic, administrative and industrial center of the country. From the top: Centro Internacional de Bogotá, La Candelaria, Torre Colpatria, Capitolio Nacional and the Gold Museum. The city begins the 21st century with important changes in its urban space and public transport, looking to plan a demographic and economic growth that would position it as a strategic hub for international business in Latin America. Some of the main interventions initiated in this century looked to develop projects contained in the Plan of Territorial Ordering (POT), which will guide the development of the city for the next two centuries. One of the most important interventions in the city for this time was its transportation system. In 1967, there were 2,679 urban buses in Bogotá that transported, on average, 1,629,254 passengers per day. The city had a little more than a million inhabitants and 8,000 hectares in length, the service was relatively reasonable and comfortable. But as the city grew and reached more than five million inhabitants and an area greater than 30,000 hectares, not only did the car fleet increase substantially to reach more than 20,000 vehicles, but chaos multiplied, as well as pollution and the inefficiency of the only existing transportation system. By the end of the 20th century, the situation was critical. There was no real urban public transport system that would serve as an alternative to the private vehicle - which further incentivized its use - and the city had low levels of competitiveness in Latin America, as well as an unsatisfactory quality of life for the vast majority of its inhabitants. The administrations of mayors Andrés Pastrana (1988-1990) and Jaime Castro (1992-1994), in addition to the first one of Antanas Mockus (1995 - 1997), formulated proposals to solve the problem of public transport, with limited results. 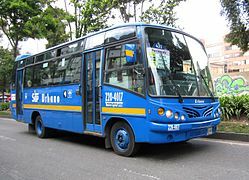 It was during the mayoralty of the latter when there was an insistent talk about the possibility of establishing a mass transportation system that would help remedy the problem of mobility in Bogotá. Mayor Enrique Peñalosa (1998-2000) included in his government program as a priority project a solution to the problem of public transport. Consequently, in the execution of the development plan "For the Bogotá we Want" in terms of mobility and in a concrete way to the massive transportation system project, the construction of a special infrastructure exclusively for its operation was determined. This system would include specialized bus corridors, equipped with single-use lanes, stations, bridges, bike paths and special pedestrian access platforms, designed to facilitate the user's experience in the system. International Business Center, Bogota D.C.
As for 2019, the city's distribution is composed of nine main business centers (Av. El Dorado Business Corridor, Centro Internacional, Parque de la 93, El Lago, North Point, Calle 100, Santa Barbara Business Center, Zona Industrial Montevideo & Parque Industrial Zona Franca). Grittier sides sit south and southwest, where working-class barrios continue to battle their reputations for drugs and crime. 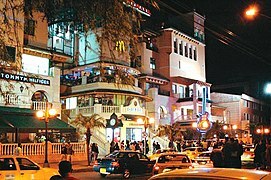 In the ritzier north you'll find boutique hotels, corporate offices and well-heeled locals piling into chic entertainment districts such as the Zona Rosa and Zona G.
In addition to TransMilenio, the Peñalosa administration and voter-approved referenda helped to establish travel restrictions on cars with certain license plate numbers during peak hours called Pico y placa; 121 kilometres (75 miles) of Ciclovía on Sundays and major holidays; a massive system (376 km (234 mi) as of 2013) of bicycle paths and segregated lanes called ciclorrutas; and the removal of thousands of parking spots in an attempt to make roads more pedestrian-friendly and discourage car use. Ciclorrutas is one of the most extensive dedicated bike path networks of any city in the world, with a total extension of 376 kilometres (234 miles). 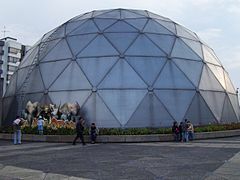 It extends from the north of the city, 170th Street, to the south, 27th Street, and from Monserrate on the east to the Bogotá River on the west. The ciclorruta was started by the 1995–1998 Antanas Mockus administration with a few kilometers, and considerably extended afterwards with the development of a Bicycle Master Plan and the addition of paths hundreds of kilometers in extent. Since the construction of the ciclorruta bicycle use in the city has increased, and a car free week was introduced in 2014. On 25 December 1884, the first tramway pulled by mules was inaugurated and covered the route from Plaza de Bolívar to Chapinero, and in 1892, the line connecting Plaza de Bolívar and La Sabana Station started operating. The tramway ran over wooden rails and was easily derailed, so steel rails imported from England were eventually installed. In 1894, a tramway car ran the Bogotá–Chapinero line every 20 minutes. The tram system eventually grew to cover most of the city and its surrounding suburbs. But during the Bogotazo riots of 1948, the system suffered heavy damage and was forced to close. The economic effects of the subsequent civil war that followed prevented the damage from being repaired. Parts of the system continued to operate in a reduced state until 1951, when they were replaced by buses. Most of the streetcar tracks were eventually paved over, but exposed tracks can still be seen on many of the older roads of the city, especially downtown and in the La Candelaria area, although it has been about 70 years since any vehicles have run on them. 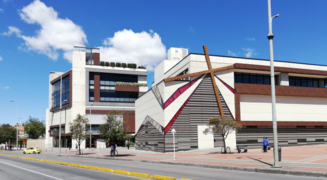 Bogotá has many cultural venues including 58 museums, 62 art galleries, 33 library networks, 45 stage theaters, 75 sports and attraction parks, and over 150 national monuments. 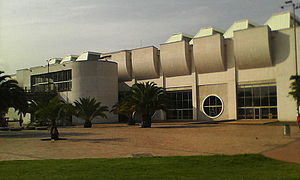 Many of these are renowned globally such as: The Luis Ángel Arango Library, the most important in the region which receives well over 6 million visitors a year; The Colombian National Museum, one of the oldest in the Americas, dating back to 1823; The Ibero-American Theater Festival, largest of its kind in the world, receives 2 million attendees enjoying over 450 performances across theaters and off the street; The Bogotá Philharmonic is the most important symphony orchestra in Colombia, with over 100 musicians and 140 performances a year. The city has been a member of the UNESCO Creative Cities Network in the category of music since March 2012. Kids' Choice Awards Colombia, are the most important awards given in the city by Nickelodeon and the first ceremony was given in 2014 by the singer Maluma and in Corferias the ceremony has been the home of shows given by artists like Austin Mahone, Carlos Peña, Don Tetto and Riva among others. ^ a b "Bogotá una ciudad Andina" (in Spanish). la Alcaldía Mayor de Bogotá. Retrieved 19 November 2010. ^ a b "2005 Census" (in Spanish). Departamento Administrativo Nacional de Estadística DANE. Retrieved 10 February 2012. ^ "Respuestas fisiológicas de los niños al ejercicio ante las variaciones climáticas en Bogotá" (in Spanish). Universidad Pedagógica Nacional. 2008. Retrieved 29 December 2008. ^ "Microsoft Word - PerfilMunicipal.doc" (PDF). Retrieved 12 March 2013. ^ "Microsoft Word - PerfilMunicipal.doc" (PDF). Retrieved 3 June 2014. ^ "Bogotá's lesson in crime fighting". Comunidad Segura. 2005. Retrieved 28 December 2008. ^ "Chapinero waterfalls – Hiking a secret place in Bogotá – Review of Andes EcoTours, Bogota, Colombia – TripAdvisor". www.tripadvisor.com. Retrieved 17 September 2015. ^ "Alameda de Quebrada Vieja (Bogota, Colombia): Address, Hiking Trail Reviews – TripAdvisor". www.tripadvisor.com. Retrieved 17 September 2015. ^ "Proyecto de Acuerdo 651 de 2008" (in Spanish). Secretaria de Gobierno de Bogotá. 2008. Retrieved 29 December 2008. ^ King, Danny (26 February 2014). "Bogota citizens give up automobiles in first ever Car Free Week". green.autoblog.com. autobloggreen. Retrieved 28 August 2014. ^ "Bogota Public Transportation Statistics". Global Public Transit Index by Moovit. Retrieved 19 June 2017. Material was copied from this source, which is available under a Creative Commons Attribution 4.0 International License. ^ "Bogota designated as UNESCO City of Music". www.unesco.org. United Nations Educational, Scientific and Cultural Organization. Retrieved 3 October 2018. ^ Ministerio de Cultura "Cristobal Colon Theater"
^ Staff, The City Paper (17 October 2018). "The International Art Fair of Bogotá ready to host the world". The City Paper Bogotá. Retrieved 10 February 2019. The Juan Amarillo, Arzobispo, or Salitre River is a river on the Bogotá savanna and a left tributary of the Bogotá River in Colombia. The river originates from various quebradas in the Eastern Hills and flows into the Bogotá River at the largest of the wetlands of Bogotá, Tibabuyes, also called Juan Amarillo Wetland. The total surface area of the Juan Amarillo basin, covering the localities Usaquén, Chapinero, Santa Fe, Suba, Barrios Unidos, Teusaquillo, and Engativá, is 12,892 hectares (31,860 acres). Together with the Fucha and Tunjuelo Rivers, the Juan Amarillo River forms part of the left tributaries of the Bogotá River in the Colombian capital. 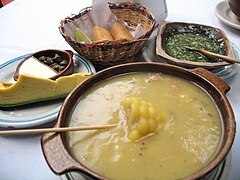 Bacatá is the name given to the main settlement of the Muisca Confederation on the Bogotá savanna. It mostly refers to an area, rather than an individual village, although the name is also found in texts referring to the modern settlement of Funza, in the centre of the savanna. Bacatá, alternatively written as Muequetá or Muyquytá, was the main seat of the zipa, the ruler of the Bogotá savanna and adjacent areas. 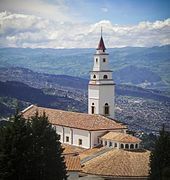 The name of the Colombian capital, Bogotá, is derived from Bacatá, but founded as Santafe de Bogotá in the western foothills of the Eastern Hills in a different location than the original settlement Bacatá, west of the Bogotá River, eventually named after Bacatá as well. 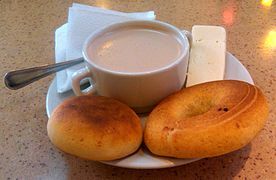 The word is a combination of the Muysccubun words bac, ca and tá, and means "(enclosure) outside the farmfields", referring to the rich agricultural lands of the Sabana Formation on the Bogotá savanna. Bacatá was submitted to the Spanish Empire by the conquistadors led by Gonzalo Jiménez de Quesada on April 20, 1537. 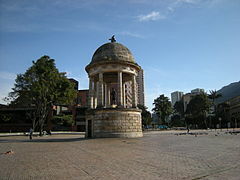 Santafe de Bogotá, the capital of the New Kingdom of Granada, was formally founded on August 6, 1538. The last zipa of an independent Bacatá was Tisquesusa, who died after being stabbed by a Spanish soldier. His brother, Sagipa, succeeded him and served as last zipa under Spanish rule. The name Bacatá is maintained in the highest skyscraper of Colombia, BD Bacatá, and in the important fossil find in the Bogotá Formation; Etayoa bacatensis. The Bancolombia Open was a professional tennis tournament played on outdoor red clay courts. It was part of the Association of Tennis Professionals (ATP) Challenger Tour. It was held annually in Bogotá, Colombia, from 1994 (as an ATP World Series tournament from 1994 to 1997, as an ATP International Series tournament from 1998 to 2001, and as a Challenger from 2004 to 2010). The Bogotá River is a major river of the Cundinamarca department of Colombia, crossing the region from the northeast to the southwest and passing along the western limits of Bogotá. The large population and major industrial base in its watershed have resulted in extremely severe pollution problems for the river. The Bogotá savanna is a montane savanna, located in the southwestern part of the Altiplano Cundiboyacense in the center of Colombia. The Bogotá savanna has an extent of 4,251.6 square kilometres (1,641.6 sq mi) and an average altitude of 2,550 metres (8,370 ft). The savanna is situated in the Eastern Ranges of the Colombian Andes. The Bogotá savanna is crossed from northeast to southwest by the 375 kilometres (233 mi) long Bogotá River, which at the southwestern edge of the plateau forms the Tequendama Falls (Salto del Tequendama). Other rivers, such as the Subachoque, Bojacá, Fucha, Soacha and Tunjuelo Rivers, tributaries of the Bogotá River, form smaller valleys with very fertile soils dedicated to agriculture and cattle-breeding. Before the Spanish conquest of the Bogotá savanna, the area was inhabited by the indigenous Muisca, who formed a loose confederation of various caciques, named the Muisca Confederation. The Bogotá savanna, known as Bacatá, was ruled by the zipa. The people specialised in agriculture, the mining of emeralds, trade and especially the extraction of rock salt from rocks in Zipaquirá, Nemocón, Tausa and other areas on the Bogotá savanna. The salt extraction, a task exclusively of the Muisca women, gave the Muisca the name "The Salt People". In April 1536, a group of around 800 conquistadors left the relative safety of the Caribbean coastal city of Santa Marta to start a strenuous expedition up the Magdalena River, the main fluvial artery of Colombia. Word got around among the Spanish colonisers that deep in the unknown Andes, a rich area with an advanced civilisation must exist. These tales bore the -not so much- legend of El Dorado; the city or man of gold. The Muisca, skilled goldworkers, held a ritual in Lake Guatavita where the new zipa would cover himself in gold dust and jump from a raft into the cold waters of the 3,000 metres (9,800 ft) high lake to the northeast of the Bogotá savanna. After a journey of almost a year, where the Spanish lost over 80% of their soldiers, the conquistadors following the Suárez River, reached the Bogotá savanna in March 1537. The zipa who ruled the Bogotá savanna at the arrival of the Spanish was Tisquesusa. The Muisca posed little resistance to the Spanish strangers and Tisquesusa was defeated in April 1537 in Funza, in the centre of the savanna. He fled towards the western hills and died of his wounds in Facatativá, on the southwestern edge of the Bogotá savanna. The Spanish conquistador Gonzalo Jiménez de Quesada established the New Kingdom of Granada with capital Santa Fe de Bogotá on August 6, 1538. This started a process of colonisation, evangelisation and submittance of the Muisca to the new rule. Between 65 and 80% of the indigenous people perished due to European diseases as smallpox and typhus. The Spanish introduced new crops, replacing many of the New World crops that the Muisca cultivated. Over the course of the 16th to early 20th century, the Bogotá savanna was sparsely populated and industrialised. The rise in population during the twentieth century and the expansion of agriculture and urbanisation reduced the biodiversity and natural habitat of the Bogotá savanna severely. Today, the Metropolitan Area of Bogotá on the Bogotá savanna hosts more than ten million people. Bogotá is the biggest city worldwide at altitudes above 2,500 metres (8,200 ft). The many rivers on the savanna are highly contaminated and efforts to solve the environmental problems are conducted in the 21st century. The Colombia Davis Cup team represents Colombia in Davis Cup tennis competition and are governed by the Federación Colombiana de Tenis. Colombia currently competes in the Americas Zone of Group I and have never competed in the World Group. In 2018, they have reached the Play-offs to the World Group for the sixth time. For the first time in its history, Colombia advances to the World Group, winning 4–0 to Sweden in the Play-off in 2019 Davis Cup. Department of Cundinamarca (Departamento de Cundinamarca, Spanish pronunciation: [kundinaˈmaɾka]) is one of the departments of Colombia. Its area covers 22,623 square kilometres (8,735 sq mi) (not including the Capital District) and it has a population of 2,598,245 as of 2013. It was created on August 5, 1886 under the constitutional terms presented on the same year. Cundinamarca is located in the center of Colombia. Cundinamarca's capital city is Bogotá, the capital of Colombia. 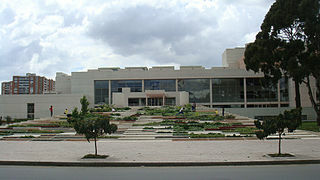 This is a special case among Colombian departments, since Bogotá is not legally a part of Cundinamarca, yet it is the only department that has its capital designated by the Constitution (if the capital were to be ever moved, it would take a constitutional reform to do so, instead of a simple ordinance passed by the Cundinamarca Assembly). In censuses, the populations for Bogotá and Cundinamarca are tabulated separately; otherwise, Cundinamarca's population would total over 10 million. The Eastern Hills (Spanish: Cerros Orientales) are a chain of hills forming the eastern natural boundary of the Colombian capital Bogotá. They are part of the Altiplano Cundiboyacense, the high plateau of the Eastern Ranges of the Colombian Andes. The Eastern Hills are bordered by the Chingaza National Natural Park to the east, the Bogotá savanna to the west and north, and the Sumapaz Páramo to the south. The north-northeast to south-southwest trending mountain chain is 52 kilometres (32 mi) long and its width varies from 0.4 to 8 kilometres (0.25 to 4.97 mi). The highest hilltops rise to 3,550 metres (11,650 ft) over the western flatlands at 2,600 metres (8,500 ft). The Torca River at the border with Chía in the north, the boquerón (wide opening) Chipaque to the south and the valley of the Teusacá River to the east are the hydrographic limits of the Eastern Hills. Geologically, the Eastern Hills are the result of the westward compression along the Bogotá Fault, that thrusted the lower Upper Cretaceous rocks of the Chipaque Formation and Guadalupe Group onto the latest Cretaceous to Eocene sequence of the Guaduas, Bogotá, Cacho and Regadera Formations. The fold and thrust belt of the Eastern Hills was produced by the Andean orogeny with the main phase of tectonic compression and uplift taking place in the Pliocene. During the Pleistocene, the Eastern Hills were covered by glaciers feeding a large paleolake (Lake Humboldt) that existed on the Bogotá savanna and is represented today by the many wetlands of Bogotá. The main tourist attractions of the Eastern Hills of Bogotá are the Monserrate and Guadalupe Hills, the former a pilgrimage site for centuries. Other trails in the Eastern Hills follow the creeks of La Vieja, Las Delicias and others. The busy road Bogotá – La Calera crosses the Eastern Hills in the central-northern part and the highway between Bogotá and Villavicencio traverses the southernmost area of the hills. The eastern side of the Eastern Hills is part of the municipalities La Calera, Choachí, Ubaque and Chipaque. The Eastern Hills were sparsely populated in pre-Columbian times, considered sacred by the indigenous Muisca. The native people constructed temples and shrines in the Eastern Hills and buried their dead there. The Guadalupe and Monserrate Hills, important in Muisca religion and archaeoastronomy, are the hilltops from where Sué, the Sun, rises on the December and June solstices respectively, when viewed from the present-day Bolívar Square. The construction and expansion of the Colombian capital in Spanish colonial times caused excessive deforestation of the Eastern Hills. Reforestations were executed in the 1930s and 1940s. Large parts of the Eastern Hills are designated as a natural reserve with a variety of flora and fauna, endemic to the hills. Despite its status as a protected area, the Eastern Hills lie in an urban setting with more than ten million inhabitants and are affected by mining activities, illicit construction, stream contamination, and frequent forest fires. Several proposals to fight the environmental problems have been written in the past decades. El Dorado International Airport (IATA: BOG, ICAO: SKBO) is an international airport serving Bogotá, Colombia and its surrounding areas. The airport is located mostly in the Fontibón district of Bogotá, although it partially extends into the Engativá district and the municipality of Funza in the Western Savanna Province of the Cundinamarca Department. In 2017, it served almost 31,000,000 passengers, 770,000 metric tons of cargo, and 304,330 aircraft movements. This makes El Dorado the third busiest airport in Latin America in terms of passenger traffic, the second busiest in terms of aircraft movements, and the busiest in terms of cargo. El Dorado is also by far the busiest and most important airport in Colombia, accounting for just under half (49%) of the country's air traffic. El Dorado is a hub for the Colombian flag-carrier Avianca, LATAM Colombia, Satena, Wingo, and a number of cargo companies. It is owned by the Government of Colombia and operated by Operadora Aeroportuaria Internacional (OPAIN), a consortium composed of Colombian construction and engineering firms and the Swiss company Flughafen Zürich AG, the company that operates Zurich International Airport. The airport has been named the best airport in South America by World Airport Awards. El Dorado received four-star certification and its staff was rated the best in South America by Skytrax, as well as achieving 42nd place in Skytrax's World's Top 100 Airports in 2017. The Fucha River is a river on the Bogotá savanna and a left tributary of the Bogotá River. The river originates in the Eastern Hills of the Colombian capital Bogotá and flows westward through the city into the Bogotá River. It is one of the three important rivers of the city, together with the Tunjuelo and Juan Amarillo Rivers. Independiente Santa Fe, known simply as Santa Fe, is a professional Colombian football team based in Bogotá, that currently plays in the Categoría Primera A. They play their home games at the El Campín stadium. Santa Fe is one of the three most successful teams in Colombia, winning seventeen titles, which includes 9 national championships (most recently in 2016), three Superliga Colombiana, two Copas Colombia, and international titles such as one Copa Sudamericana, one Suruga Bank Championship, and one Copa Simón Bolívar. Santa Fe is one of the three clubs that has played every championship in the Categoría Primera A.Santa Fe became the first Colombian team to win the Copa Sudamericana, and the first Colombian team to win an official tournament outside America. The club was recognized as one of the ten best clubs in the world in 2015 by the IFFHS, occupying the seventh position and being the best ranked of South America.Santa Fe has a fierce rivalry with Millonarios who share the same stadium. The game is considered as one of the most famous derbies in South America and is known as El Clásico Bogotano or El Clásico Capitalino. 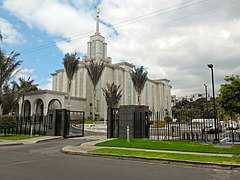 This list of tallest buildings in Colombia ranks skyscrapers in Colombia by height. This lists ranks Colombia skyscrapers that stand at least 150 metres (492 feet) tall, based on standard height measurement. This includes spires and architectural details but does not include antenna masts. The new current tallest building in Bogotá is the BD Bacatá, In June 2, 2015 it became taller than Torre Colpatria, which held the title of the tallest building in Colombia since 1979. When finished, The BC Bacatá is expected to be 216 meters (709 ft) tall. Metropolitan Area of Bogotá is the metropolitan area of the Colombian capital city of Bogotá, usually used for statistical analysis or technical use. 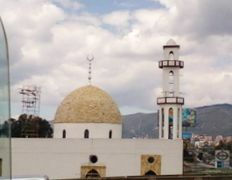 The study included the Capital District of Bogotá and 17 of the surrounding municipalities in the Department of Cundinamarca; Soacha, Facatativá, Zipaquirá, Chía, Mosquera, Madrid, Funza, Cajicá, Sibaté, Tocancipá, La Calera, Sopó, Tabio, Tenjo, Cota, Gachancipá and Bojacá. Bogotá and its metropolitan area (ranging in altitude from 1,800 metres (5,900 ft) to 4,200 metres (13,800 ft)) had a population of 9.8 million in 2015. Open Bogotá (officially named for sponsorship reasons Seguros Bolívar Open Bogotá, previously:Open Seguros Bolívar) is a tournament for professional tennis players played on outdoor clay courts and has been held in Bogotá, Colombia since 2007. From 2005–2013, it was an Association of Tennis Professionals (ATP) Challenger Tour men's event. The tournament was not held in 2014 but returned to the Challenger Tour in 2015. The event was also held as an ITF Women's Circuit tournament and from 2008 to 2011 the tournament had a $25,000 prize fund. A one-off $100,000+H women's tournament was also held in 2014. Wetlands of Bogotá, Colombia are important areas of the capital city, and their development has become increasingly important for the area north of the Andes. A reserve for fauna and flora, the wetlands provide for the preservation and reproduction of a wide variety of mammals, reptiles and birds. These include more than 70 species of migratory birds, as well as many endemic plant species. The wetlands are part of the Bogotá River basin. Three types of wetland ecosystems have been identified in the district, differentiated by origin and position: plain wetlands are located in urban areas, while hillside and wasteland wetlands have been identified in the capital's rural areas. Many of the wetland ecosystems are disappearing because of advanced population growth within the city of Bogota. With the passage of time and the steady growth of the city, it is estimated that of the 150,000 hectares (370,000 acres) of wetlands that covered Bogotá in 1940, only 1,500 hectares (3,700 acres) remain today.